NEW YORK -- A detective heard on video berating an Uber driver and asking, "How long have you been in this country?" was stripped of his gun and badge Wednesday and will be transferred from the police anti-terrorism division, officials said. Police Commissioner William Bratton called Detective Patrick Cherry's comments inappropriate as the city's Civilian Complaint Review Board, a police watchdog agency, investigated the incident. 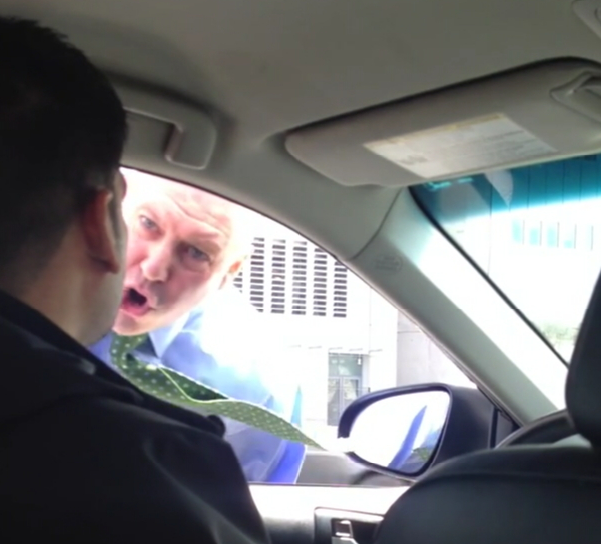 Seen widely on a passenger's video posted online, the episode comes as the New York Police Department's rank-and-file officers are being trained in how to engage courteously with the public to de-escalate situations. "In any kind of encounter, discourtesy like that and language like that is unacceptable," Bratton said. "That officer's behavior reflected poorly on everyone who wears our uniform." City Detectives' Endowment Association President Michael J. Palladino said Cherry is "a person of good character and an excellent detective," and he noted that personal matters can affect police behavior sometimes. "Wrong place, wrong time, wrong event, to be on videotape, you know, looking like you're abusing a civilian," retired NYPD Sgt. Joseph Giacalone told CBS News. The detective pulled over the driver with the ride-hailing service Uber on Monday in Manhattan. It's not clear exactly what spurred the traffic stop, but Cherry is seen on the video accusing the driver of committing various traffic violations while the detective tried to park his car. The detective swears, shouts at the driver and brusquely questions his accented English as the driver gives compliant responses, calling the detective "sir" and apologizing at one point for interrupting to say, "OK."
"I don't care what you have to say. Do you understand that?" the detective says at one point, adding that people should be able to park "without your interference and then your opinion about what's going on - especially when the person you do it to are the police!" After saying he doesn't know "where you're coming from, where you think you're appropriate in doing that," Cherry asks the man how long he's been in the U.S. The driver tells him it's been two years. Cherry goes on to say the driver would be handcuffed and taken to a precinct for summonses if the detective weren't busy with other things: "You're not important enough," he says. San Francisco-based Uber, which has grown rapidly in New York in recent years, called the detective's behavior "wrong and unacceptable." Police and the company haven't released the driver's name. The passenger who shot the video referred questions about the encounter to authorities. CBS News was unable to reach Cherry Wednesday morning for comment.